Look back through the classic, old books on golf instruction and you'll find this common bit of advice: During the downswing, keep your head and spine angle rock-steady still as your body unwinds. This helps prevent against getting too far ahead of the shot. You may think your head is still during your swing, but how do you know for sure? The best way is to use this simple training tool, the new SteadiHead! Place the SteadiHead into the ground or in the rubber tee at the driving range. Position your golf ball so that when you're in the address position, the black ball at the end of the SteadiHead is directly between your eyes and the golf ball. 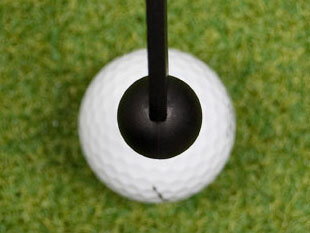 In other words, the black ball "eclipses" the golf ball. During the swing, hold your posture so that the black ball always eclipses the golf ball. Best of all the SteadiHead is fully adjustable to any club length and stance. This means you can work at having a solid, head-steady swing with a variety of clubs!